My next few posts on ‘Africa in Words’ are going to be focused on things I’ve been up to ‘professionally’, rather than my ‘research’ – although the two have some nicely blurred lines and intersections. This is partly because I only have 3 weeks left living in East Africa and it is nice to use this space as an opportunity to share and document some of my time here. However, rest assured next month I do want to use the blog to share the ideas and questions I’m wrestling with in my next draft chapter, so more on this before too long. As some of you know, I’ve been working over the last 6 months to set up a small publishing company in Rwanda called Material Books. 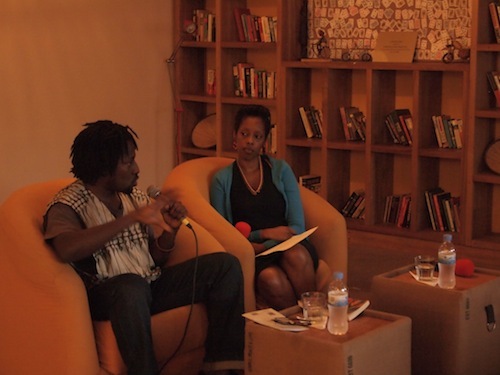 The burgeoning Kigali arts scene has been a really inspiring place to be over the last 18 months – FROM the consistently creative and inspiring Ishyo Arts Centre TO Spoken Word Rwanda organizing Rwanda’s first literary festival and attracting huge audiences TO the hilarious Comedy Nayiti performed in a mixture of English, French and Kinyarwanda. Yet, I became conscious though that the opportunities for this creativity to be ‘published’ or made available in a format that could document or travel outside of Kigali were very few. And that perhaps with my 10 years experience of working in the publishing industry, I could do something about this. I officially launched Material Books at the Spoken Word Rwanda Festival at the end of March, and I’m hoping to publish my first titles in early 2013. In the teachers’ workshop he suggested that students should be encouraged to make two columns of notes about a literary text – one representing accepted critical opinions and the other for their own opinion. Not only do I think this methodology could be a useful way of framing my own notes even at PhD level (! ), this prompted an amazingly engaged debate about encouraging critical and individual thinking in the classroom and what the parameters of this might be. 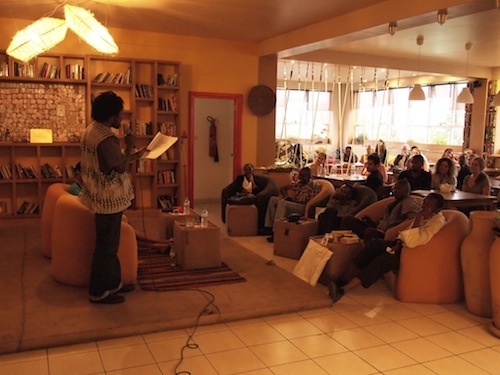 He demonstrated the immense power of poetry in performance at the cafe Shokola Lite on Saturday afternoon. Nii’s performances of ‘Unspoken’ (‘the truth lies in the unspoken’ ‘language is worthless without the patience to listen’) and ‘Mosquito Rules’ had the audience both mesmerised and then erupting with laughter. Kate – what an amazing initiative. Material Books looks superb. Many many congratulations :-)! Want more! Could you tell us a little bit more about the hole, in terms of support for creative talent, that you describe and your desire, and the clear ability, for Material Books to create positive change? Wonder, for example, what kind of titles do you think will come through for your first publications? How are you hoping to receive your ms’s? Do you have links set up with university or school programmes, or the British Council, as you describe in your post? Tell us more – tell us more!! Also wondering if you are hoping to host more events with writers, and if that will continue to be focussed on opening debates to pedagogical concerns – to quote Nii Ayikweii Parkes and the Material Books weekend event, ‘language is worthless without the patience to listen’ – and how your soon-to-be distance of Brighton might impact that. Would also be really interested to hear a little more about the funding situation (I feel like I’d like to interview you, please!). first: Kate, this is so exciting! Congratulations! Yes, we want more more more about all this, which takes me to my second point: Katie, why don’t you interview Kate? This would be great! And we can publish it here as part of launching Material Books in AiW!